After a gourmet meal at the Tuckamore Lodge in Main Brook, Newfoundland one can enjoy a fabulous piece of Lemon Meringue Pie. Each dessert that is served to the guests at the Tuckamore Lodge in Main Brook, Newfoundland is delicious but nothing beats a fresh piece of Lemon Meringue Pie with whip cream and lemon on the side. One bite of a freshly baked pie makes one's taste buds go crazy and one piece of pie never seems to be enough at the Tuckamore Lodge. Lemon Meringue Pie, Tuckamore Lodge, Main Brook, Viking Trail, Trails to the Vikings, Great Northern Peninsula, Northern Peninsula, Newfoundland, Newfoundland Labrador, Canada. 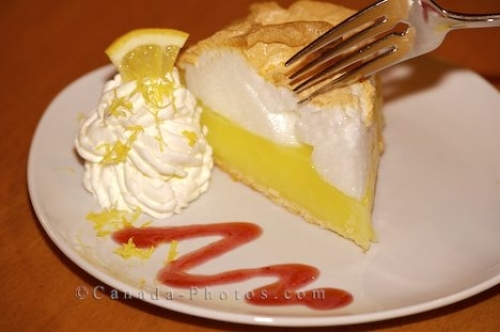 Picture of a slice of Lemon Meringue Pie served at the Tuckamore Lodge in Main Brook in Newfoundland, Canada.